The wrapping paper is from Hallmark (which is definitely fancier than the dollar-bin variety that I typically purchase), but I love the colors and the pattern. 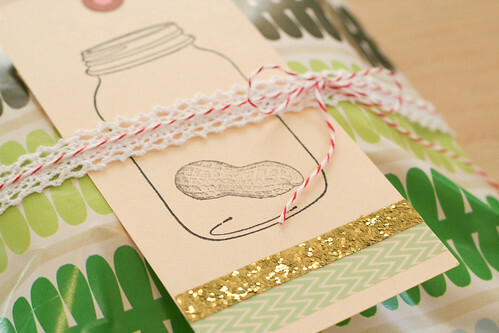 I added a bit of lace and bakers twine, along with a handmade card on a manila tag. 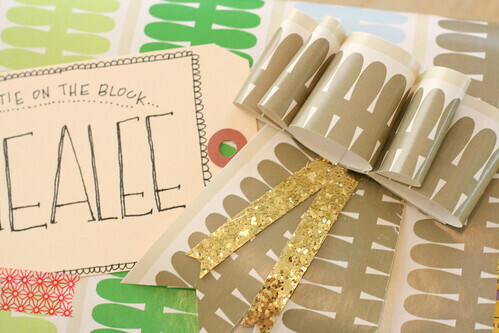 For the record, manila tags are my new favorite craft supply thanks to Amanda over at Oh My Little Dears. 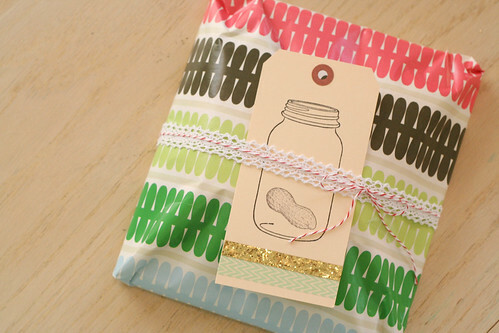 I used the peanut stamp because I have the tendency to refer to babies as peanuts. Shouldn't we all? Anyway, it made me happy, so there you go. Having shower guests bring decorated diapers is the best idea in humanity. I wish I would have done that at my own shower, because sweet mercy you go through so many diapers with a newborn! I don't miss those days. Truly. Anyhow, I wanted the diapers to match the actual gift, so I stuck with the same wrapping and added some of my fancy-shmancy handwriting on another tag. I realized that I spelled "bootie" wrong, but then I figured that putting "booty" felt more like a rap video reference or something, which probably didn't belong on a baby shower gift anyway, so…I regret nothing. Making these wrapping paper bows are so simple, and something I'm sure other people do all the time, but I like to tell myself I'm being original. (Also, hurrah for not having to actually buy over-priced bows!) I typically cut too much wrapping paper when I'm wrapping up a gift and will end up with small leftover bits that I just hate to throw away. I figured out a way to just loop the paper over itself and tape it up to become a very simple bow. 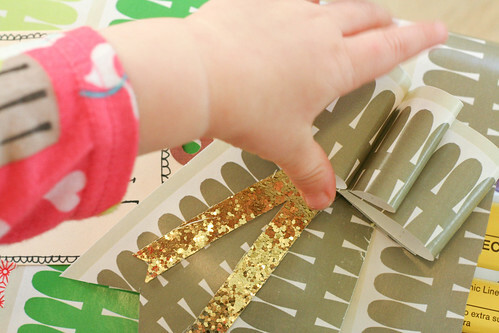 Add two additional "ribbons" of paper (and glitter tape, of course) and voila! 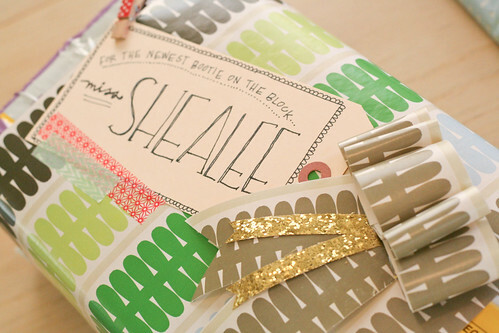 Presenting a gift with personalized gift wrapping has always been important to me. I don't even mind knowing that it will all be thrown away once it has been opened. It's one of those creative things where the process makes it all worth while, you know? I love the yous in the world who make gifts that extra special. Love this! 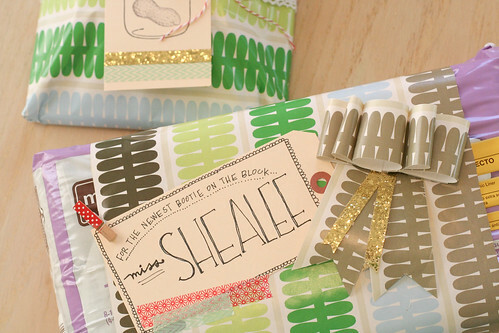 I love the idea of taking time to make the gift look pretty, but it doesn't always happen. But with stacks of doilies and ribbon laying around, I don't have an excuse! This is a beautiful package. I love when friends go the extra step to personalize gifts!